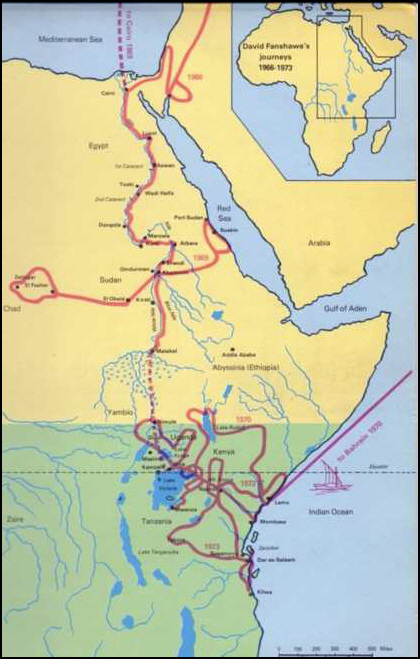 The Sanctus journey, from the Mediterranean to Lake Victoria and from the mountains of West Sudan to the Red Sea, became the framework of the composition - a symbolic cross-shaped pilgrimage. Armed with one rucksack and a stereo tape recorder, Fanshawe succeeded in recording music from well over fifty tribes, achieving such a close rapport with many local communities that they gave permission for their performances to be specially recorded. The African Sanctus journeys were sponsored by the Ralph Vaughan Williams Trust and the Winston Churchill Memorial Trust.